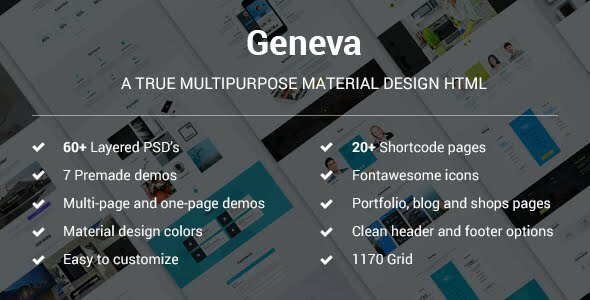 Geneva is a Google Material HTML Template that is perfectly designed for App, Restaurant, Architecture, Events & Workshops, Designer, Business, Corporate, Resume, Personal Template, Portfolio, Creative, Blog and Shop. Geneva Includes all the Latest Design Trends of Google Material that makes it a good choice. It is a Single and Multi Page Template made in 1170 Grid.